it’s difficult to sleep when you are on the top of a double decker bus and every turn feels like we’re tipping over. I snap awake every time. You may be asking why we were stupid enough to do it this time, then? I still woke up every time we braked, which made for a long night. 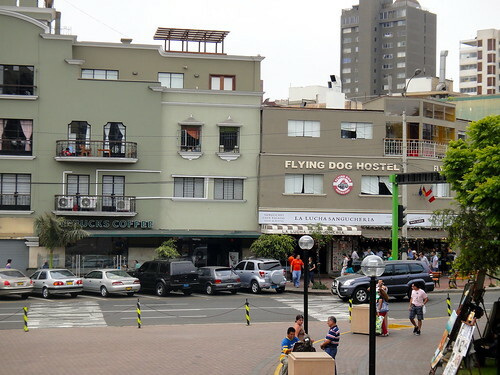 Nevertheless, we arrived safely in Lima at around 9 a.m. (Note to self, again: no more night buses.) As usual, we didn’t have a room lined up for the night and with it being New Years Eve, we needed to get on the ball. So, we asked a cab driver to take us to a cafe with wifi to scope out potential locations online. Next thing we knew the cab had stopped and we were parked directly in front of a miracle, our relaxing oasis for the week….Starbucks! We didn’t realize how much we missed the infrastructure and luxuries of home until we stepped out of this cab beaming from ear to ear and practically charging the door for some tasty goodness in a cup. Things got even better when we walked up to the counter and the barista understood, “Can I have an iced grande skinny vanilla latte?” in English! Heaven! We also found La Lucha Sangucheria next door of which we frequent at least once a day for sandwiches, another luxury. 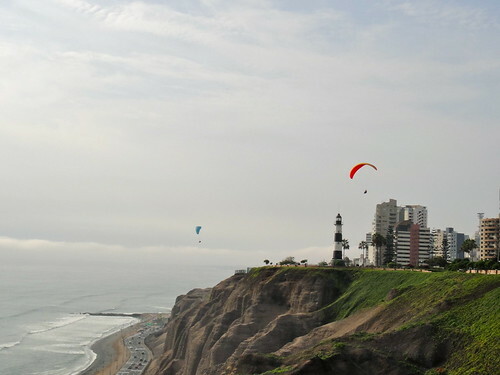 Now, don’t worry, Starbucks and La Lucha aren’t the only great things in Lima. 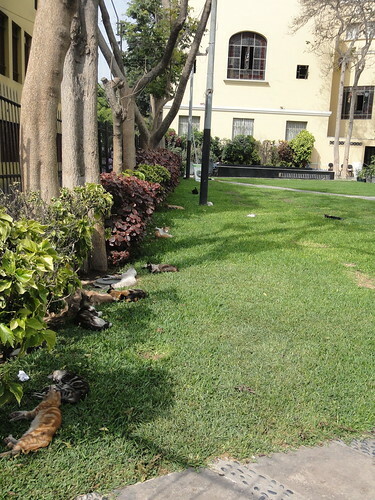 The neighborhood of Miraflores is so nice, clean and has beautiful parks full of flowers and …cats. 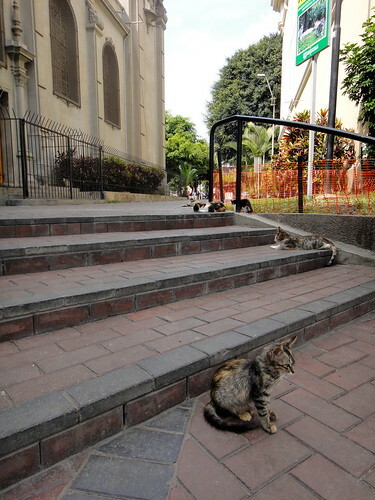 The church near our favorite cafe takes care of all of these cats that live in Parque Kennedy de Miraflores. They’re a welcome sight as they are much prettier to look at than the thousands of mangy looking stray dogs we have seen in the rest of South America. 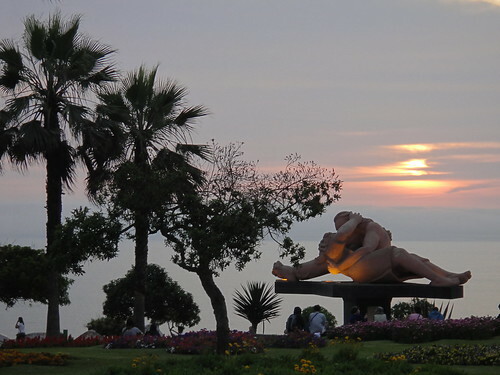 Another great park is Parque del Amor, a beautiful park on a cliff that over looks the ocean. From there you can watch paragliders hovering over the edge or the surfing action taking place below. It is an incredible sight. 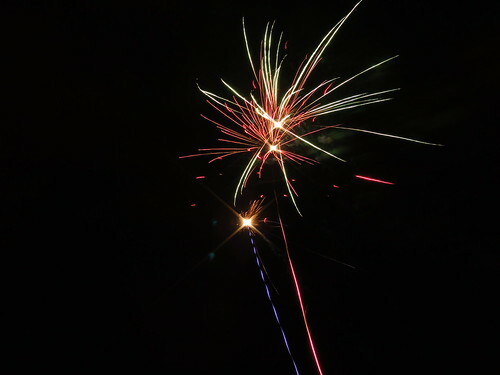 Our New Years celebration occurred here with some new friends, Arlo and Oksana, who we met in Banos, Ecuador. 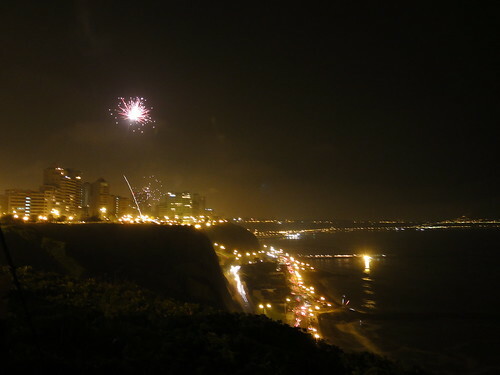 We were surrounded by amateaur (illegal) fireworks all night and rang in the new year with a great view of more chaotic explosions down the coast. As for other perks…some of you will laugh at me for this, but I am loving the mall! I’m not such a fan of them at home as well as most of those we’ve seen in South America. I have no need to buy anything since traveling light is key, so it seems like a waste of time as well as bit of sensory overload. Not this mall. Larcomar sits on the edge of the cliff with a view of the ocean. Step out of a store and you’re looking at surfers. It’s an incredible structure. 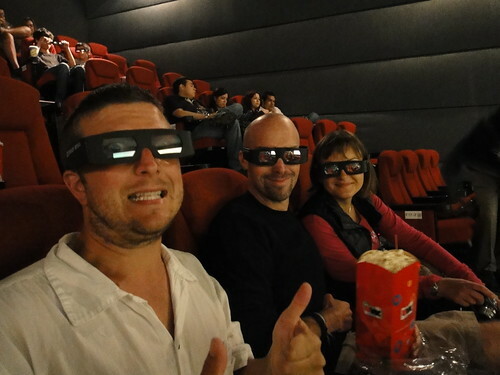 Not only that, the mall has a theater where we were able to see Tron 3d in English with Arlo and Oksana. It may seem strange that we are so interested in the normal stuff from home, but after almost 3 months of travel and constantly stepping out of our comfort zone, it’s nice to enjoy a bit of infrastructure. Afterall, we aren’t trying to run away or escape from home. We’re out here to experience and explore new places….even if that means with a Starbucks in hand.